Just $30 more to make this an electronic marker! Electronic version needs you to unscrew grip to replace battery! 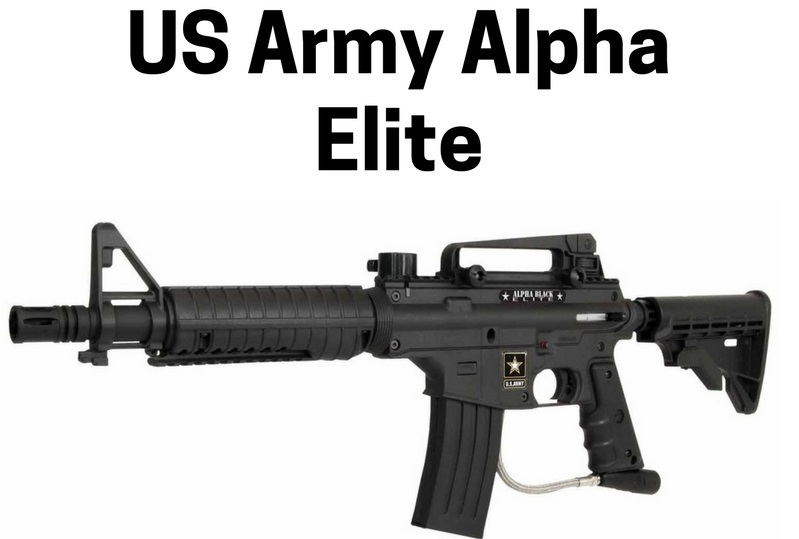 If you have ever wondered what using a real tactical gun in the field of battle might feel like, the US Army Alpha Elite might just give you a hint of that experience. Weighing almost 5 lbs and built out of robust aluminium, this gun is going to be a handful when you add your tank, hopper or cyclone feeder, sights, optics and other accessories. But then, the realistic weight will get you deep into combat mode, as you will always feel that you have a mean machine in your hands. At $149 for the mechanical version and just $179 for the electronic version, this is just a sensational, ultra-reliable gun that requires very little maintenance. This gun is so popular that Tippmann has put together a US Army Alpha Elite starter kit for just $185. This kit includes the gun, GXG anti-fog goggles, GXG aluminum CO2 tank (1,000 shots on full capacity), a 200 capacity gravity feed hopper and a harness pack capable of holding 4 pods of paintballs. This one kit purchase can let you hit the ground running on any paintball field, without additional purchases! If you are buying the kit, we recommend that you don’t use the gravity feed hopper and spend an extra $65 on the cyclone feeder that is air powered. Requiring no batteries, this Tippmann cyclone feeder uses air from the gun’s gas line. What more, it is synchronized with the trigger which means you will never chop balls, even when feeding 15 balls per second for elongated duration. If you are buying the electronic version of the US Army Alpha Elite, we highly recommend that you buy the cyclone feeder as a gravity fed hopper just won’t give you the 15 bps that you might crave. The cyclone feeder comes with a 200 ball hopper that has a low profile, giving you a more unobstructed view down the sights than traditionally tall hoppers, even if they have higher capacity. For a barrel upgrade, we recommend the 14′ J&J Ceramic Barrel that retails for $39. The ceramic and Teflon coating on this barrel reduces friction, thereby giving you a longer range with less curve, to allow you to take aim better. At just about $40, you are going to be very hard pressed to find another barrel that will give you the increased accuracy that this one does. We particularly recommend this barrel upgrade if you are going to be using your US Army Alpha Elite as an electronic gun with the e-grips, engaging semi-auto or full-auto modes a lot. All in all, a fantastic real-feel gun that will give you dependable performance with great durability. Go for the electronic version + cyclone feeder upgrade if you are the trigger happy type that likes to engage semi-auto and full-auto. On the other hand, if you are a calculative shot kind of girl or guy, the mechanical with maybe just the barrel upgrade might be more than enough for your needs.